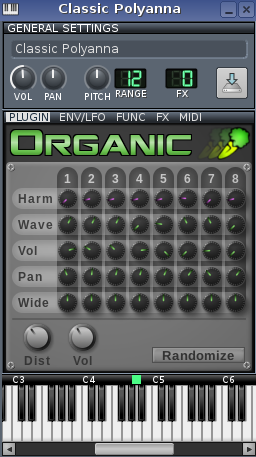 Organic is an 8-oscillator additive-type softsynth included in the Linux MultiMedia Studio (LMMS) Digital Audio Workstation. Although the developers at LMMS consider it 'for organ-like sounds,' this instrument is capable of some very expressive sounds. Each of the eight oscillators includes six waveform options (sine, triangle, saw, square, moogsaw, exponential), an independent harmonic selector, and discrete volume, panning and detune (width) knobs. Detuning is minus-plus one octave. Distortion and master volume knobs are also provided, as well as a randomizer button, which only randomizes the eight waveforms and respective volumes. As with LMMS's other synths, Organic provides the standard additional control panels: the main envelope page with dedicated sub-sections for cutoff and resonance and a variety of filters, the function section where a plethora of chording options and the arpeggiator can be adjusted, the effects section for chaining effects as desired, and a midi channel control section. 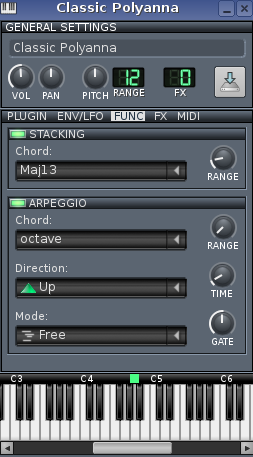 A humble beginning of my own: Organic Patches 01 Unzip the compressed file into your ~/lmms/presets/Organic directory. Refresh the (starred) LMMS presets window. 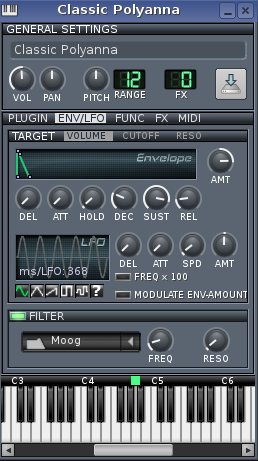 Drag the desired preset unto the instrument track and it will load.